Grilled all natural chicken in savory chicken broth with salsa fresca and citrus rice. Topped with Hass avocado slices, tortilla strips and cheese. Served with two warm, flour tortillas. 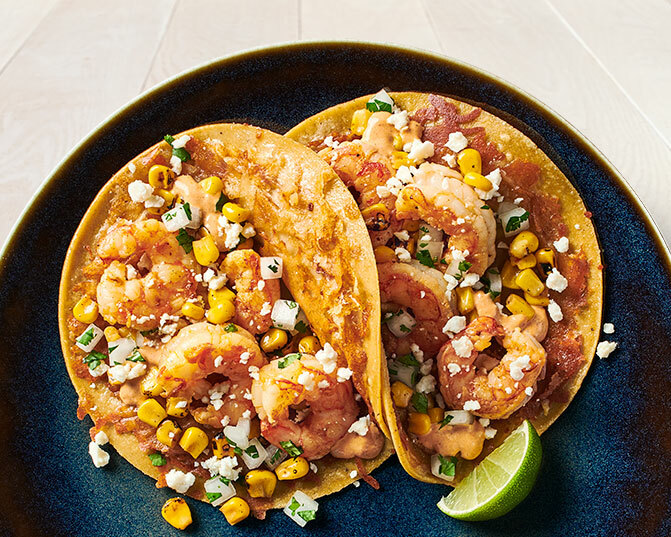 Two tacos with Wild-Caught Shrimp and Mexican street corn topped with cotija cheese, adobo rojo sauce, cilantro and onion on stone-ground corn tortillas topped with toasted cheese. Served with "no-fried" pinto beans and toritilla chips. 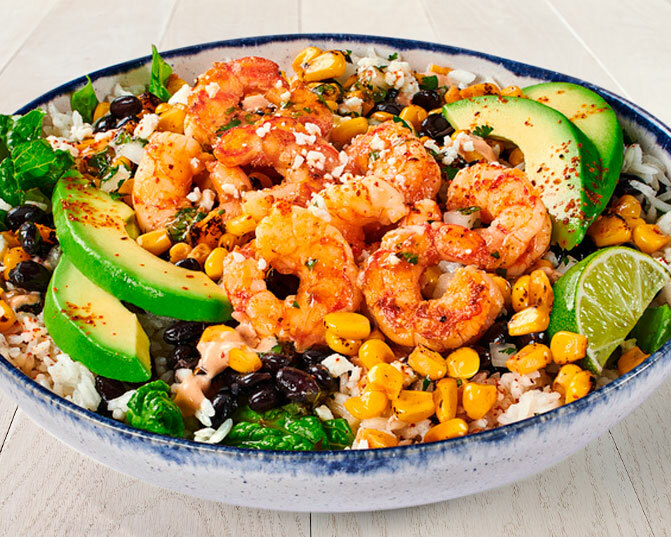 Wild-Caught Shrimp on a bed of citrus rice and romaine tipped with Mexican street corn, cotija cheese and chile lime Tajin, creamy chipotle sauce, fresh avocado slices, cilantro, onion, black beans and cilantro lime mojo sauce. 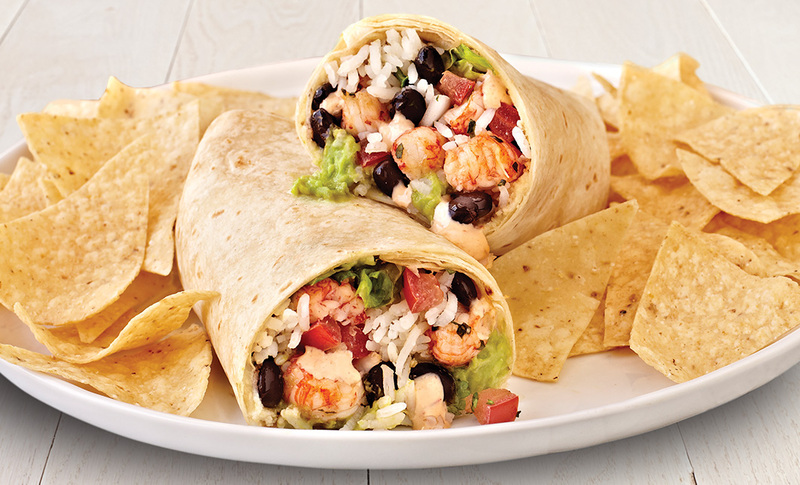 Sustainable, Wild-Caught Langostino Lobster drizzled with garlic herb butter with handmade, fresh guacamole, citrus rice, salsa fresca, garlic herb butter wrapped in a warm flour tortilla. Served with a side of tortilla chips. Roasted Stone Ground Corn or flour tortillas. Taco Plates served with chips and pinto beans. Grilled meat of your choice with guacamole, shredded cheese, lettuce, salsa fresca, and creamy chipotle sauce on a stone-ground corn tortilla. Grilled all natural chicken or steak with toasted cheese, all natural bacon, Hass Avocado slices, cilantro/onion, roasted chipotle salsa and creamy chipotle sauce on a stone-ground corn tortilla. The Original Fish Taco, Salsa Verde Shrimp Taco, and Wild Pacific Mahi Mahi Taco. Two classic tacos with guacamole, shredded cheese, lettuce, salsa fresca, and creamy chipotle sauce on a stone-ground corn tortilla. Served with "no-fried" pinto beans™ and tortilla chips. Two grilled or blackened tacos with toasted cheese, Hass Avocado slices, cilantro/onion, roasted chipotle salsa and creamy chipotle sauce on a stone-ground corn tortilla. Served with "no-fried" pinto beans™ and tortilla chips. Three tacos on a stone-ground corn tortilla. Served with "no-fried" pinto beans™ and tortilla chips. Flour or whole grain tortilla. Free chips upon request with any burrito. Grilled all natural chicken or steak with guacamole, shredded cheese and salsa fresca. Served with tortilla chips. **SEASONAL ITEM** Sustainable pan-seared shrimp with toasted cheese, all natural bacon, guacamole, citrus rice, blackened jalapenos, roasted chipotle salsa, chipotle sauce and salsa fresca. Served with tortilla chips. Burrito with citrus rice, guacamole, black beans, salsa fresca, romaine lettuce, creamy chipotle sauce and roasted chipotle salsa, Served with tortilla chips. Your choice of protein atop our new brown rice & quinoa and romaine lettuce, topped with cauliflower, poblanos, red bell peppers, fire-roasted corn, and red onion marinated in garlic, lemon and sea salt fresh sliced Hass avocados, black beans, cilantro lime mojo sauce and toasted almonds. Your choice of protein with citrus rice, black beans, guacamole, salsa fresca, chipotle sauce, romaine lettuce and your choice of roasted chipotle salsa or salsa verde. Your choice of protein with mandarin oranges, fire-roasted corn, red chiles, avocado slices and black beans on fresh mixed greens, topped with tortilla strips, white sauce and chipotle orange vinaigrette. Your choice of protein with cauliflower, poblanos, red bell peppers, fire-roasted corn, and red onion marinated in garlic, lemon and sea salt and Hass avocado slices on fresh mixed greens with a lemon agave white balsamic dressing. Your choice of protein with shredded cheese, crispy tortilla strips, salsa fresca, romaine lettuce, cabbage with chipotle ranch dressing. Your choice of protein on a bed of fresh mixed greens with mango salsa, brown rice & quinoa, fresh sliced Hass avocados, crisp tortilla strips, and drizzled with a lemon agave white balsamic dressing. Toasted flour tortilla with melted jack and cheddar cheese. Served with our handmade guacamole, our salsa fresca, sour cream and a side of lightly sea-salted chips. Tortilla chips covered with melted jack and cheddar cheese, our signature pinto beans, sour cream, guacamole and salsa fresca. Rubio's Kids Meals include a variety of entrèes, any two side items, and your choice of rBST-free milk or Dasani Bottled Water. Side items include "No-Fried" Pinto Beans™, Black Beans, Mexican Rice, Citrus Rice, Churro, Tortilla Chips or Mott's® Applesauce. Chicken is all natural and raised without antibiotics. All natural chicken, Mexican rice, black beans and shredded cheese. Served with choice of two sides and a drink. 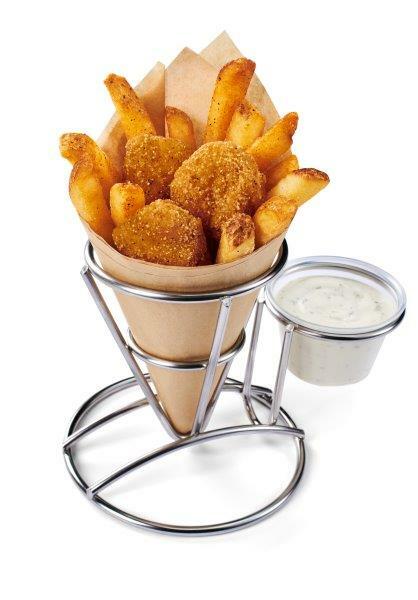 Four, all natural crispy chicken bites and seasoned French Fries. Choice of ranch or ketchup for dipping. Includes choice of kid's drink. 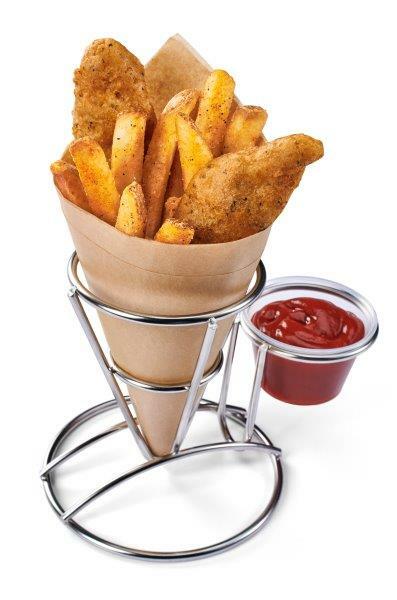 Two, hand-battered, sustainable Wild Alaska Pollock fillets and seasoned French Fries. Choice of ranch or ketchup for dipping. Includes choice of kid's drink. A warm cinnamon churro cooked to order. A delicious build your own taco experience: Grilled all natural chicken, grilled steak or beer-battered Wild Alaska Pollock served with fresh guacamole, cheese, lettuce, sides, signature salsas and chips. Burrito platters include an assortment of burritos, sides and signature salsas. SERVES 6 // Choose any 3 burritos cut into 6 halves and 16 quesadilla wedges, tortilla chips, 2 signature salsas, guacamole & sour cream. SERVES 10// 40 cheese quesadilla wedges. Served with fresh guacamole and salsa fresca. SERVES 10// 40 All Natural Classic Chicken Taquito halves. Topped with melted cheese and served with fresh guacamole and salsa fresca. SERVES 20 // Handmade guacamole topped with salsa fresca and cotija cheese, served with tortilla chips. Burrito Boxes are customized meals served in individual boxes with dessert. SERVES 5 -- Choice of Roasted chipotle salsa, mild salsa, salsa fresca, tomatillo salsa or salsa picante. 8 small churros, 8 small brownies & 8 small limon coconut bars. SERVES 10 // Choice of Mango or Black Tea. Served in our easy pour container with sliced lemons, sugar & Splenda® packets and cups. SERVES 10 // Choice of Regular or Light. Served in our easy pour container with cups.